At normal tissue pH (left), the polymer is not active and does not kill bacteria. 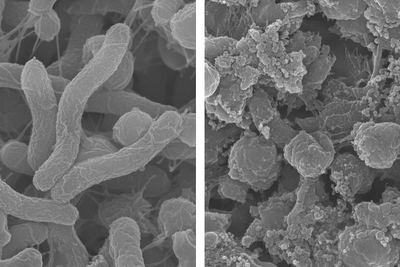 But in an acidic environment (right), it disrupts the H. pylori bacteria’s membranes to kill it. Images courtesy of Jianjun Cheng. CHAMPAIGN, Ill. — A new shape-shifting polymer can target and kill Helicobacter pylori bacteria in the stomach without killing helpful bacteria in the gut. Such a treatment could improve the digestive health of billions of people worldwide who contract H. pylori infections. The antimicrobial agent morphs into a bacterial hole-puncher in the stomach’s acidic environment and reverts to an amorphous, inactive structure when it reaches the higher pH environment of the small intestine. Researchers developed a shape-shifting antibiotic agent that kills infectious H. pylori bacteria in the stomach, but does not kill helpful bacteria in the intestine. 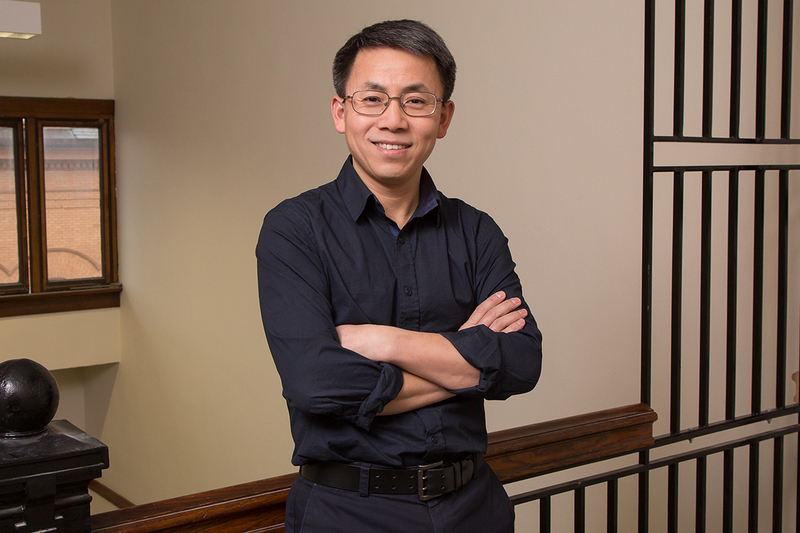 Illinois professor Jianjun Cheng led the research team. The standard treatment for H. pylori infections requires a cocktail of several antibiotics and an agent to reduce acidity in the stomach so that the antibiotics can work. This has the unfortunate side effect of killing off 65 to 80 percent of other bacteria in the digestive tract, Cheng said – bacteria crucial to maintaining digestive health, nutrient absorption and the immune system. Cheng’s group previously developed short protein chains that twist into a helical spiral, giving them a stiff, rodlike structure that can punch holes through bacterial membranes – a method of killing to which bacteria have little ability to develop resistance. With a few simple alterations to the side chains that branch out from the polymer backbone, the researchers were able to create a shape-shifting version of the hole-punching agent. When in the pH range in most body tissues, the proteins are shapeless and limp, unable to get through cell membranes. But at acidic pH levels found in the stomach, they curl up into the spiral rod structures, allowing targeted killing of H. pylori. “Traditional treatment involves complicated drug designs and combinations. This drug is very easy to manufacture and scale up. It’s just a polymer – a polypeptide chain with amino acid building blocks – and it’s biodegradable,” Cheng said. Editor’s notes: To contact Jianjun Cheng, call 217-244-3924 ; email: jianjunc@illinois.edu. To contact Lin-Feng Chen, call 217-333-7764; email: lfchen@life.illinois.edu.